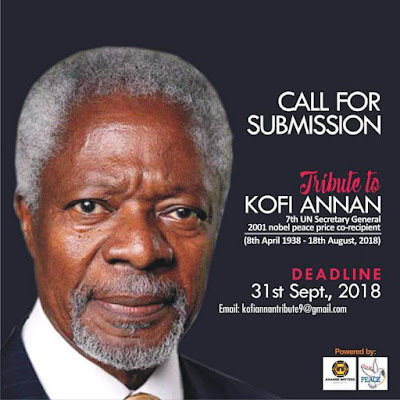 The month of September has been viewed historically as a month of key significant events - a month to remember and as such we have dedicated it to the remembrance of one of the greatest African legends and peace activists -Kofi Annan. Born 8th April, 1938; Kofi Atta Annan was a Ghanaian diplomat who served as the seventh Secretary-General of the United Nations,from January 1997 to December 2006 and also the co-recipients of the 2001 Nobel Peace Prize. He was the founder and chairman of the Kofi Annan Foundation , as well as chairman of The Elders, an international organization founded by Nelson Mandela. He died 18 August, 2018. Entries are hereby requested from poets and writers from either of the categories - Poetry, Article or Essay - as tributes to this great peace activists who was passionate and dedicated to world peace and equality in his life time. Only one article/essay is permissible. Email subject should read "Tribute to Annan"
No attachment, submission should be placed in the body of mail.